These are the latest additions to the bag that functions as my purse but which is actually an 18L daypack. 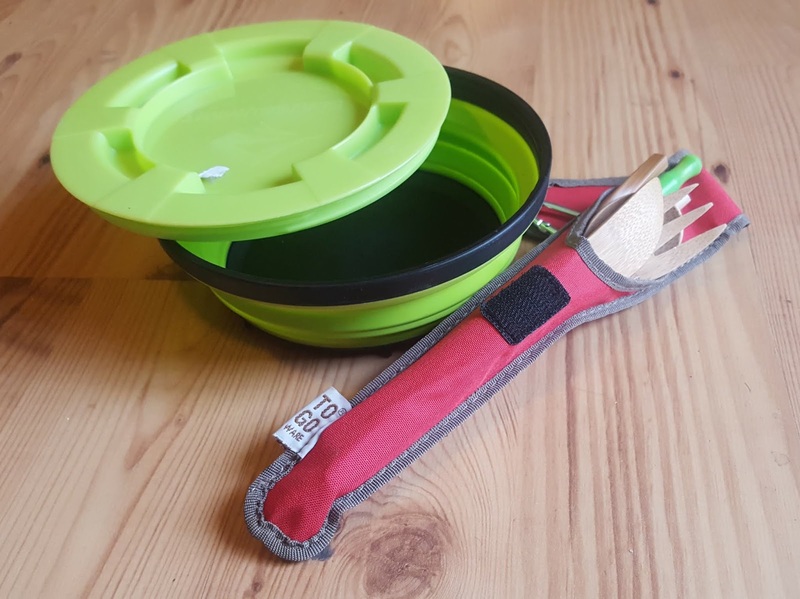 They are a to-go ware set of bamboo utensils with a steel straw that I tucked in there and a collapsible Sea to Summit container with leak proof lid. These live in their own zippered compartment along with an occasional stainless steel mug. I am stepping up my efforts to remove single use plastic from my life. National Geographic has launched a Planet or Plastic initiative aimed at protecting the ocean by reducing the amount of plastic that gets washed into the sea. Since most of the plastic comes from developing countries with insufficient trash and recycling infrastructure I know that my part to reduce single use plastic will have practically a negligible impact on the amount of plastic in the ocean. And yet. In modeling carrying reusable utensils and collapsible food container as well as beverage container and shopping bags, I am making a difference in my riverside community. It's not only the oceans that have too much plastic in them. There's too much of it everywhere including right here. 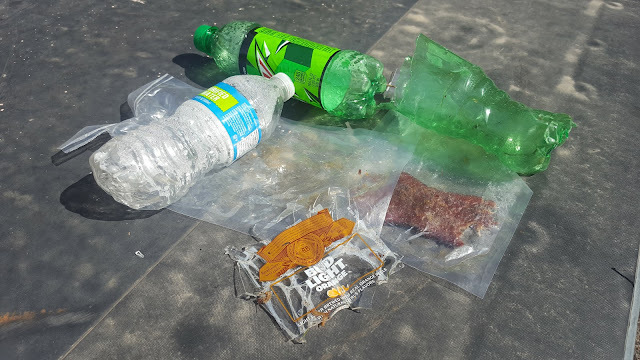 Below is a picture of the plastic I picked up during a 5 minute walk in the park along the river yesterday. 5 minutes! I didn't have to stretch or scramble for them, either. It was right there on the ground a few steps off the path. This is an example of where thinking globally but acting locally will make a difference locally. John Muir, the founder of the Sierra club, explorer of Alaskan wilderness, champion of Yosemite park, was a journaler. The University of the Pacific maintains many of John Muir's papers and has made them accessible by putting the digital images online. They have invited the public to participate as citizen curators and assist with transcribing the journals to make them more accessible. I spent the better part of a Friday evening recently trying to decipher two short sentences from Muir. 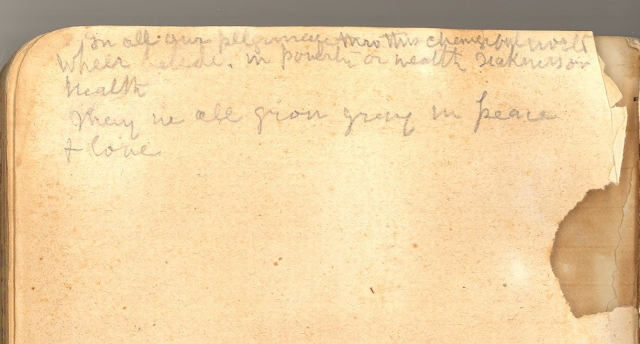 Between the faded ink and the sprawling script, the challenge was real. I ended up projecting the journal entry I was attempting to transcribe onto a TV screen and lying on the living room floor, looking at it for about 10 minutes. And then, like that, I saw the words. Most of them, anyway. I thought his journal said "changeabul world" but the professor in charge of the project wrote it as changeful world and on second inspection I would have to agree. May we all grow gray in peace & love. In a Seattle state of mind. I traveled to Seattle for a few days between my last post and this one. This was my first visit and according to the locals I was there during a stretch of especially nice weather, sunny with temps in the 60's and 70's. Indeed, I expected more rain and Starbucks. My work required staying on a ship which did not sail anywhere. The ship was docked in the port of Seattle next to massive fishing trawlers that were so huge that I did not take a picture because I knew I could not do justice to their size. My colleague on this trip, John Mitchell, wondered at the biomass these trawlers take out of the sea. One of the trawlers in port was the SS Ocean Phoenix. At 680 feet long, it is as long as city block. I don't know how tall it is but 10 stories at the highest point above the pier feels about right to me. It can hold 4,200 tons of what its owner Pacific Premier calls product or the all the different forms of Pollock it fishes and processes. I suppose this helps answer the question about biomass. With numbers like these, I better understand the pressure this could put on an ocean fishery. I have never really liked fish but after hearing of the overfishing of our oceans I am less likely to eat it. I now only eat fish if I know where it comes from which usually translates as someone I know has caught it. For those that enjoy seafood, there are apps to help you eat in good conscience. I've heard good things about the Seafood Watch app from Monterey Bay Aquarium. Overfishing is a thing. I learned this on my Grosvenor Teacher Fellowship expedition when we stopped at Siglufjörður, home of the Herring Museum. The town was the site of a herring processing plant until the fishery collapsed due to overfishing in the early 1960's. The fishery never recovered and the town lost its livlihood. The fishermen were convinced that they knew the herring better than the scientists. And to be clear, I don't know if Pacific Premier or the SS Ocean are complicit in overfishing. But after seeing these trawlers I have a much better idea of how overfishing happened. My hope is that Pacific Premier and all sea food companies are part of a movement to establish aggressive management of fisheries. Alarm about trawler size and overfishing aside, I enjoyed my time on ship. Even though the ship didn't sail, it still moved after a fashion, rising and falling with the tide. When I went to bed at night I was eye level with the bottom of the pier (my cabin was on the second to lowest level). When I awoke the next morning, I could see under the pier and by mid day the barnacles were exposed on the pier pilings. Twice I saw a heron that liked to perch on the rocks under the pier. I dithered about this because what if the tide came up quickly and the heron got trapped under the pier? Can herons swim under water? This did not happen the two days I observed the heron. Like I said, I dithered. But back to the barnacles. I have noticed how the barnacles stop attaching at certain rung on the pier ladder in the picture. There are a few scattered individuals above that line but the demarcation between good barnacle habitat and not good barnacle habitat is pretty clear. 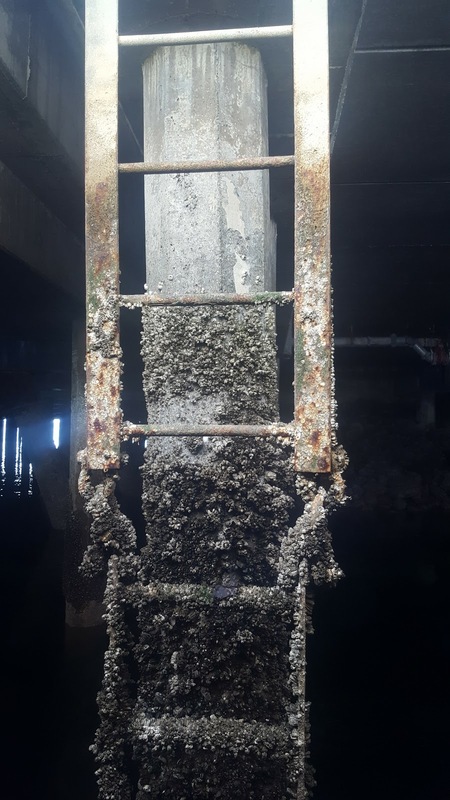 I don't know enough about barnacles to explain what makes a good habitat and what doesn't. 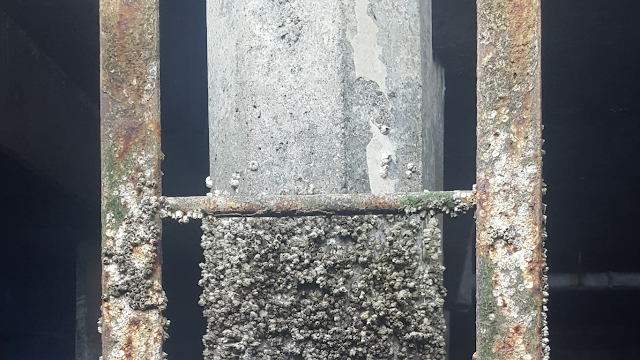 If I'd had more time to just observe barnacles and do nothing else, I probably could have developed a working explanation. Instead, it will remain a mystery until I either return to a place with barnacles or get a chance to look it up. Past experience has taught me to leave plenty of time for such work because a quick internet search can turn into an hours long self-created mini-course.